If you secure a person to the ground and surround them with a pool of water that comes up to just below their chin, leaving only their head above the surface, they’re bound to become nervous. 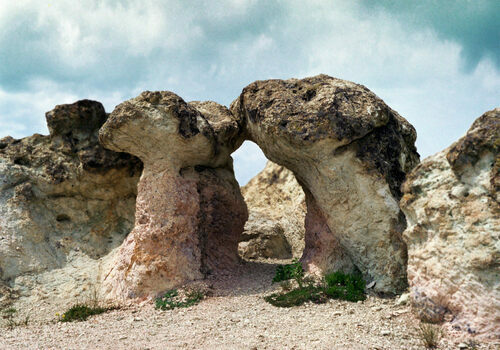 If you do the same to a rock, it becomes one of the more unique and whimsical rock formations you’ll ever see. Of course, it takes hundreds of years of erosion for that process to be complete, but the results are fairly typical: mushrooms. Gigantic, freestanding pillars in the distinct shape of mushrooms. 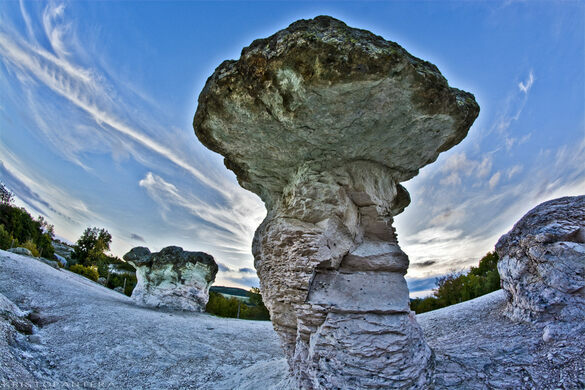 Commonly called table rocks in the West, formations like the aptly named Turnip Rock in Michigan or Jug Rock in Indiana bear a distinct resemblance to mushrooms. 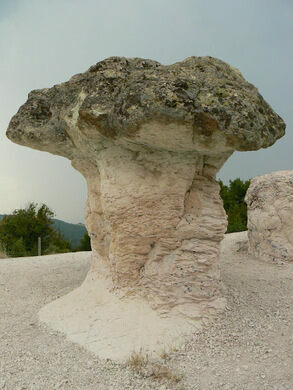 But the stone mushrooms in Beli Plast, Bulgaria are unique, and the reason is simple: mushrooms. Plural. As in, entire clumps of massive stone pillars grouped together just like mushrooms in the wild. They are formed just the way table rocks are formed: eroded into shape over years and years, as the water that once nearly submerged them lapped against their walls. And then eroded some more by the wind long after the water had receded for good. 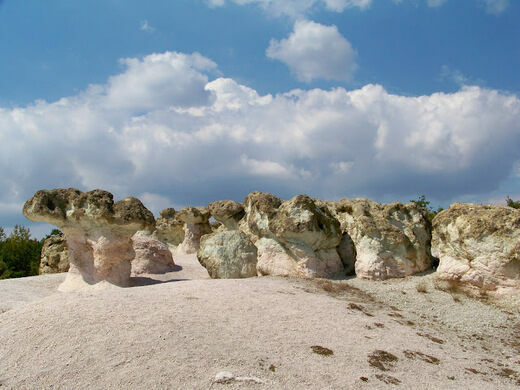 Unlike most table rocks, the formation at Beli Plast is no single monolith sticking out like a literal sore thumb. 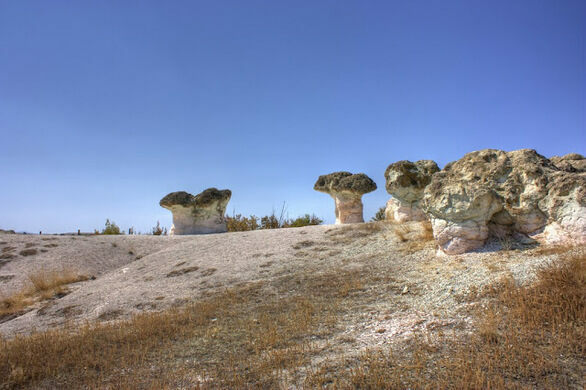 These pillars that used to form a lake bed are cute, quaint and suspiciously close in shape and color to actual mushrooms, several of them together yet independent and each reaching several meters high and weighing hundreds of pounds. Under the surface of any number of lakes and rivers, this is how many boulders, rocks and shorelines appear. But it’s rare that you find them, still in tact, in a desert area where water no longer collects. That, along with their counterintuitive shape, is what makes this collection of natural sculptures so interesting. An architectural marvel that spans the Arda River, and has stories of a haunted past.